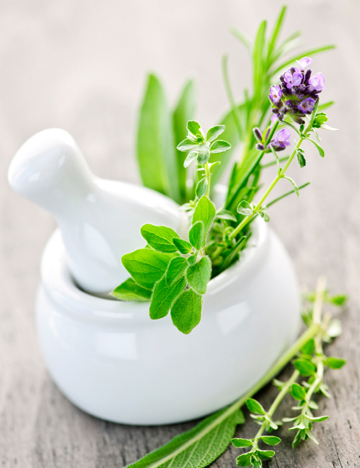 Whether you have a backyard herb garden or prefer to grow fresh herbs on your kitchen windowsill, the season’s most popular herbs, including lavender, thyme, parsley, basil and mint, can effortlessly add vibrant flavors to your everyday spring recipes and meals. Here are a few tasty and unique ways to cook with fresh herbs. Lavender isn’t just for aromatherapy products. This wonderfully fragrant flower is also edible and is surprisingly versatile in the kitchen. This purple-hued gem is actually a member of the mint family and closely related to more common herbs — rosemary, thyme and sage. The French even have a special dried herb blend that includes lavender called Herbes de Provence. If you don’t grow your own, lavender buds are available in the bulk section of many natural food markets and can be used fresh or dried. Lavender has a floral scent and a flavor that includes hints of citrus. Add fresh lavender buds to salads along with other edible flowers. Make lavender sugar by mixing lavender into your sugar bowl. Add dried buds to tea mixtures, baked goods, or use as garnish for both sweet and savory recipes. Lavender intensifies in flavor when dried and will taste overpowering if too much is added to a dish. Edible flowers are a fun addition to dessert recipes (as well as salads and drinks!). Lavender lends its floral flavor to this scrumptious crumb cake, which is featured in my cookbook Make-Ahead Meals Made Healthy (Fairwinds, July 2011). Preheat oven to 375 degrees F. Grease and flour a 9-inch cake pan. In a standup mixer fitted with the paddle attachment, beat butter and agave until light and fluffy. Add eggs one at a time, beating well after each addition. Beat in the milk. In a small bowl, whisk together flour, baking powder and salt. Add to butter mixture and blend well. Gently fold in raspberries, almonds and lavender. Pour batter into prepared pan. In a food processor, combine crumb topping ingredients. Pulse to combine. Sprinkle over batter. Bake for 40 minutes or until a cake tester inserted in the center comes out clean. Let cool completely, and then remove from pan to slice and serve. Make-ahead tip: Let cake cool completely, and then place on a baking sheet. Freeze until firm. Wrap tightly in freezer wrap, and then slip into a large freezer bag, removing as much air as possible before sealing. Freeze up to two months. When ready to serve, let thaw at room temperature for a few hours. To serve warm, place cake in a baking pan and reheat in a preheated 350 degree F oven until warmed through. Thyme is a uniquely flavored herb that has many tasty varieties, including lemon thyme, and many delicious uses. Fresh thyme can be whisked into sauces or salad dressings, stirred into rice and grain salads, rubbed onto pork and other meats, sprinkled onto potatoes and eggs, used as garnish for fish, infused into olive oil or vinegar or added to desserts for a special treat. Sweet blueberries and lemony fresh thyme join together in this simple berry preserves recipe. Spread it on toast or warm it up and pour it over chicken as a surprisingly tongue-tantalizing sauce. In a saucepan over medium-high heat, combine all ingredients. Bring to a boil, stirring often. Reduce heat to medium-low and simmer for 10 minutes. Use as a sauce right out of the pan or ladle into mason jars and refrigerate for up to one month. 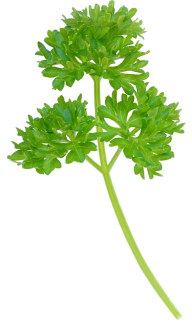 The most renowned fresh herb, parsley is available in curly or flat-leaf varieties. Curly-leaf parsley is often used as garnish on a restaurant plate (and can be eaten to aid digestion and freshen breath) but can also brighten up savory recipes. Flat-leaf parsley, also known as Italian parsley, has a stronger flavor and is used often to add parsley’s popular flavor to meals. Parsley can be whirred into pesto, stirred into soups and stews, added to sauces, tossed in green or grain salads, combined with other herbs and olive oil to form a paste to rub on meats and fish and sprinkled onto just about any savory meal as a colorful finish. Gremolata is an Italian garnish traditionally made with lemon zest, parsley and garlic. This rendition features grapefruit zest. Gremolata can be made with any citrus fruit, including oranges, clementines, tangerines or limes. It is an eye-catching accompaniment for fish, chicken or meat dishes. Using a citrus zester, remove grapefruit peel (not the white pith). Chop zest and place in a bowl. Add remaining ingredients, stirring to combine. Use immediately or store in the refrigerator for up to four hours before use. When it comes to cooking with basil, fresh is best. There are many types of varieties of basil — cinnamon basil being my favorite — that you can grow at home or get at the local farmers market. Basil can be steeped into tea, swapped in for mint in cocktails, added to salads, transformed into pesto and finely chopped into pasta, rice or other grain-based recipes. Basil can also be stirred into soups and stews. For the best basil flavor, add fresh basil towards the end of cooking since its distinctive flavor will fade the longer it is subjected to heat. The union of fresh basil and sweet apricot turns ordinary green tea into a refreshing gourmet drink. Put tea bags and basil in a large heat-proof bowl. Pour water over tea bags and stir. Let steep for five minutes. Strain tea through a colander into a large heat-proof pitcher. Let tea cool, and then refrigerate until chilled. Stir in apricot nectar and syrup. Serve tea over ice. Garnish with fresh basil leaves. To make simple syrup: Combine one cup granulated sugar and one cup water in a saucepan over high heat. Bring to a boil, stirring often to dissolve sugar. Reduce heat and simmer for two to three minutes, stirring often. Remove from heat and let cool. Store syrup in an airtight container in the refrigerator. Mint is one of those hardy herbs that will take over your garden if you let it. The good news is, this refreshing herb can be used in sweet or savory dishes, so you’ll always have a delicious use for it. The most basic mint varieties are spearmint and peppermint, but if you’re lucky, you can find more intriguing types, such as chocolate mint. Add fresh mint to teas or cocktails (think: mojito), or finely chop it into tabbouleh and other grain dishes, toss it in salads, sprinkle it over vegetables, stir it into salsa, and add it to your favorite chocolate desserts for a minty-fresh update. 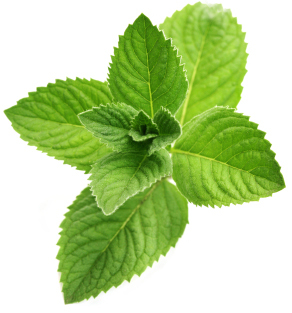 Mint adds a refreshing vibrance to regular sugar. Mint sugar is super easy to make and can be deliciously used in tea or lemonade or even swapped in for regular sugar in chocolate desserts for that lovely mint and chocolate marriage of flavors. Place sugar and mint in a spice grinder and grind until mint is finely chopped. Store in an airtight container and use within two weeks. Chef’s note: Alternatively, you can place a few fresh mint leaves in your sugar jar. The longer the leaves are in the jar, the stronger the mint flavor.